You may receive updates from Power Shift Network, the sponsor of this petition. Take action and make your voice heard. 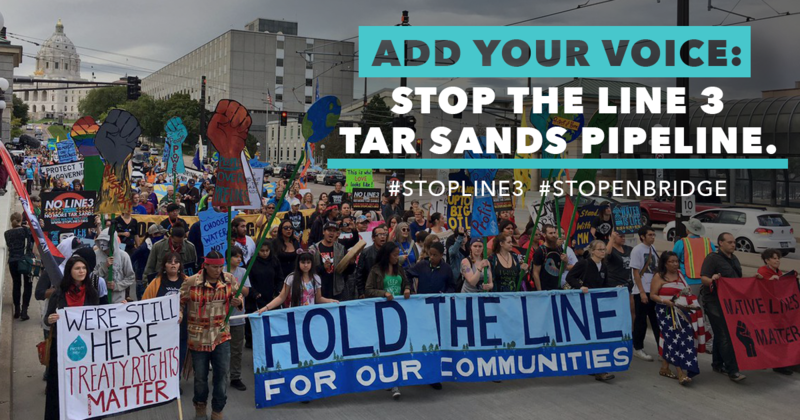 Submit your public comment saying NO to the Line 3 tar sands pipeline today. The Line 3 tar sands pipeline expansion would be a disaster for our water, land, communities, and climate. But right now, we have our best chance to stop this dirty pipeline project once and for all. The state of Minnesota's Public Utilities Commission has the power to decide whether or not this huge dirty oil pipeline gets built. Right now, they're accepting a FINAL round of comments from the public before they make their decision. This country and our state need clean energy and climate solutions, not more dirty tar sands pipelines. But Enbridge—the largest pipeline company in the world—wants to build a new pipeline that would carry more than 400,000 barrels a day of the world’s dirtiest oil across some of Minnesota’s most pristine lakes and wild rice beds. The Youth Climate Intervenors are asking people everywhere to stand with them and speak out against this pipeline. Take action today and demand that our elected leaders hold the line to protect our communities, and say NO to Line 3 pipeline. Once you've submitted your comment, check out this incredible Teen Vogue article about the Youth Climate Intervenors—the 13 young Minnesotans who are leading the fight on the ground to stop this pipeline. This is a powerful, inspiring group of people—and it means a lot that you're standing with them. You can also follow the Youth Climate Intervenors on Facebook here. I oppose Enbridge’s proposed Line 3 pipeline and believe it should not be granted a Certificate of Need. This project endangers both young people today and generations to come. It would violate our rights to a stable climate, clean water, safe communities, and cultural inheritance. By Minnesota statute, “the consequences to society of granting [the certificate of need]” must be “more favorable than the consequences of denying [it. ].” Because of the tremendous costs of this pipeline, and the fact that those costs would fall disproportionately on future generations, it is clear that this condition is not met. I stand with the Youth Climate Intervenors in defending the rights of young and future generations from the local and global impacts this pipeline would have. The recent Environmental Impact Statement for the Line 3 expansion says it would threaten over 100 bodies of water with the risk of catastrophic spills, and cause more than $287 billion in climate damages over just the first 30 years of operation. These numbers, though daunting in their own right, fail to do justice to the consequences to society imposed by Line 3. The perpetuation of violence and trauma to Minnesota’s indigenous peoples is morally and lawfully unacceptable, given the state’s commitments to tribal consultation and environmental justice (including the EPA Policy on Consultation and Coordination with Indian Tribes and the Minnesota Pollution Control Agency’s Consultation Policy). The proposed pipeline route runs through some of the most pristine wild rice beds in the world, which is an assault on the cultural, subsistence, and economic staple of the Anishinaabeg people. By proposing to construct this pipeline through the heart of 1855 Treaty territory, Enbridge has shown a blatant disregard for the guaranteed land use rights of Minnesota’s indigenous peoples. Young people today and future generations don’t need this pipeline—we need clean water and a safe and livable future. In a time of climate change, our investments should be in a clean energy future, not in the toxic infrastructure of the past. Therefore, I stand with the Youth Climate Intervenors and strongly oppose the issuance of a Certificate of Need for a new Line 3 pipeline.